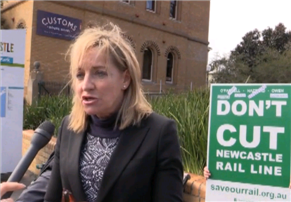 Video: Rally challenges mandate to cut railway ← Save Our Rail NSW Inc. 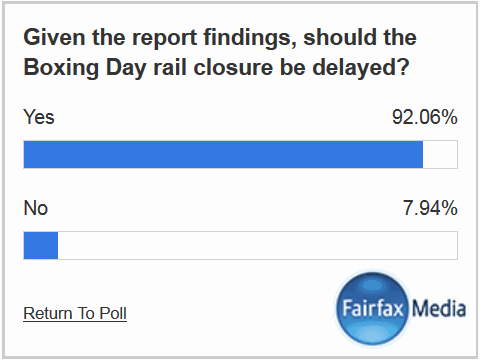 The Newcastle Herald provided coverage, including a video piece, of today’s rally at Newcastle Station. INSPIRED by recent revelations at the Independent Commission Against Corruption, the fight against the cutting of the heavy rail line in Newcastle returned to the streets yesterday. About 100 protesters came from across the Hunter, Sydney and even Perth, waving placards and warning of the demise of the city. Save Our Rail members were joined by EcoTransit Sydney representatives, as well as federal Labor member for Perth Alannah MacTiernan for the rally, which began at Newcastle station. Ms MacTiernan, formerly the West Australian infrastructure minister who oversaw the state’s 72-kilometre rail line project from Perth to Mandurah, said the NSW government should reverse its rail cut decision. The government should also work towards a faster service between Newcastle and Sydney.